The University of St. Thomas’ Joshua Layfield built his own HPC cluster to support his research and teaching. State-of-the-art HPC clusters tackle complex problems and mountains of data. 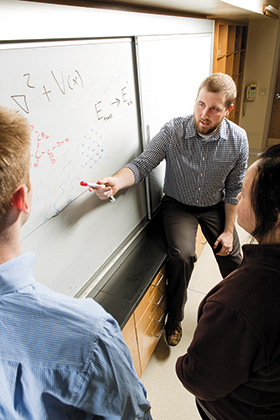 The University of St. Thomas in St. Paul, Minn., doesn’t yet have a campuswide high-performance computing (HPC) center, so Joshua Layfield, an assistant professor of chemistry, built one for himself. Layfield’s research into the interface between molecules in different states, like much of leading-edge science today, requires massive computational capabilities. Since March, a Hewlett-Packard ProLiant Gen9 server cluster, with its 384 processors, has provided the number-crunching power that Layfield and his students need. “We have a computer lab where we can run calculations for classroom activities and some upper-level labs, but I couldn’t get a whole lot done on the research side of things without the HPC system,” says Layfield, who is starting his second year at the private university, whose total enrollment is about 10,200 students. The research happening there is not only valuable for the knowledge it produces, but also crucial to teaching students how the field works, Layfield says. “Research is the major way we help our students understand chemistry, including the computation and data analysis we do with the HPC cluster,” he says. As he did with other researchers who set up HPC outposts at the university, Enterprise Architect and IT Operations Manager Eric Tornoe consulted with Layfield about connectivity, power and cooling issues for his cluster. Tornoe looks forward to a future when researchers won’t have to put together and manage their own HPC systems at the university. High-performance computing has become essential to tackling the burgeoning mounds of research data in a growing array of fields, says Steve Conway, research vice president for HPC at IDC. According to Conway, spending for HPC in higher education is rising steadily, and even small schools have labs with HPC clusters. Many large universities are building HPC centers to serve the needs of faculty across all disciplines. Researchers also contract time at regional and national supercomputing centers. The Georgia Institute of Technology, which serves 21,500 students in Atlanta, created the Partnership for an Advanced Computing Environment (PACE) center in 2009 to offer high-performance computing as a central resource for its researchers, says Neil Bright, the chief HPC architect. The PACE center has grown rapidly, both in processing power and adoption by the Georgia Tech research community, Bright says, and now contains more than 1,400 servers and 35,000 processors. PACE users include the “usual suspects” from disciplines such as biology, physics, chemistry and biomechanics, but Bright sees increased adoption from researchers in the social sciences, such as psychology. An HPC data center presents most of the same issues that arise in conventional consolidated data centers, such as power and cooling, but on a larger scale, Bright says. PACE is a “very heterogeneous” environment because equipment is added as researchers get funding for their projects. The PACE research computing team is largely focused on ensuring the stability of the HPC platform as well as anticipating and balancing the processing needs of users. PACE has had an impact on research funding at Georgia Tech. When a state supercomputing center closed in 2003, NCSU recognized the need to provide centralized HPC for researchers across the university, says Eric Sills, the executive director of shared services at NCSU, a university serving almost 34,000 students. “Some researchers go their own way with dedicated HPC clusters, but we wanted to change our model to make the resources widely available,” he says. While the exact configuration of the data center shifts as projects are added or older servers are removed, it has grown to a cluster of about 1,000 server nodes representing about 10,000 processors. The center standardized on IBM/Lenovo Flex System blade servers of various generations, but all use Intel Neon processors. Besides power and cooling issues, minimizing network latency is one of Sills’ main concerns; connections in the HPC data center are either 10 Gigabyte Ethernet or InfiniBand to streamline data flow. The HP ProLiant Gen9 server cluster that Joshua Layfield installed this year will be the workhorse that will provide the computations to develop proof of concept for his research at the University of St. Thomas. He will then apply for time at a regional supercomputing center to test his findings on larger data sets, he says. The most powerful supercomputer in the U.S., the Titan at Oak Ridge National Laboratory in Oak Ridge, Tenn., has 18,688 server nodes with a total of 552,960 processors, which dwarfs even high-powered HPC clusters such as those at Georgia Tech and North Carolina State University. And the processing capacity of supercomputers is growing at a startling rate, says IDC’s Steve Conway.